Even if you've been presented with a linear narrative boasting a straightforward approach, successfully translating a novel into screenplay format is tough enough as it is. However, when you're given something as richly layered and structurally complicated as Audrey Niffenegger's bestselling book club-favorite The Time Traveler's Wife, you wind up with as many hurdles to climb as scribe Eric Roth did when he brought both Forrest Gump and The Curious Case of Benjamin Button to cinematic life. 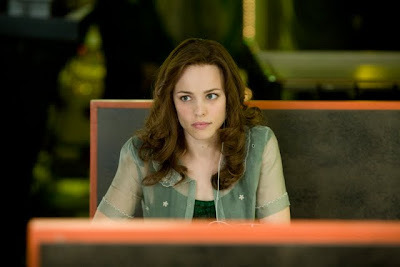 Therefore it's no wonder that not only was Time Traveler's Wife often compared to Roth's recent Button, (which starred Time producer Brad Pitt) but also incessant that criticism surrounding the logic and lack thereof in the movie's sequence of events abounded throughout the film's reviews. However, because it's currently an undiscovered phenomenon, the fact that film critics can presume to understand the minutia of quantum mechanics, string theory and particle physics involved in a science fiction component like time travel is as ludicrous as parts of the film itself... especially when you realize that these same individuals buy right into the Star Wars or the Star Trek franchise which recently starred Bana. And although I was a bit fuzzy on some of the “rules” by which the film operated with regard to time traveling and likewise grant that it's fairly confusing for the first act in the way it establishes time, character and place for those who haven't read the novel, Time Traveler's Wife is nowhere near the epic disappointment of something like Love in the Time of Cholera nor does it stand with the anti-heroic and upsetting Kite Runner, both of which it seems were best left on the page. While obviously it's missing the in-depth details of the novel, considering the additional hurdle of the mere 107 cram-it-all-in running time, overall screenwriter Bruce Jay Rubin who's no stranger to supernatural love stories (Ghost) has managed to make an entertaining, non-cynical, unabashedly old-fashioned, swoon-worthy picture that hooked this reviewer far more than the big screen version of The Notebook, which launched the career of Time's Rachel McAdams. 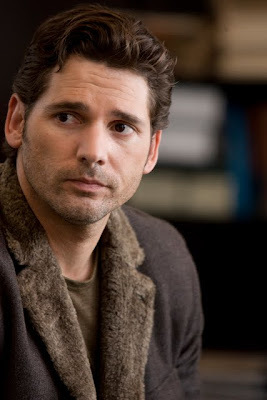 While McAdams plays our lovely heroine referenced in the film's title-- in the movie more than the novel, we're far more invested in the life of Henry (Eric Bana) as his plight is so fascinating that everyone else including The Time Traveler's Wife feels like they're simply players on the metaphysical and metaphorical stage. Yet when it begins, it's the other way around as Clare (McAdams) initially appears to librarian Henry and the audience as a cute art student coed with a serious crush as she can't resist trying to touch the man she loves but who currently takes her for a stranger. Of course, aside from her winning smile and genetic perfection, there's something oddly innocent and urgent about her arrival that inspires Henry to meet up with her. And after dinner turns into breakfast, they've become a couple again in what to us feels like the first time. One of the confusing factors of Time is not just the idea that Henry can travel from one place to another and arrive naked because he's never sure how old he will be (yet since it's Bana we look past the ick factor without a second thought), but rather that there are multiple Henrys forever traveling. Often, Henry arrives in places that are familiar like to the meadow where he first met Clare as a young girl and refused to give into her eventual crush until adulthood or answer any questions that could hinder her development. Likewise, he ritually arrives during the holidays to the road where his mother perished in a car accident and where he was also approached by an older version of him explaining what just happened and his ability as a time-traveler. So with this piece of information in mind, it's safe to say that the movie asks an awful lot from an intelligent audience in suspending disbelief. However, if you give into it, I think you'll find the rewards are worth it, as witnessed in this gorgeously transferred Blu-ray that--like the recent Boogie Nights and Mangolia New Line Cinema releases-- add a life-like crisp audio balance to the soundtrack evident in high-definition that separates it from the WB pack. This being said, of course, even the the addition of a digital copy of the film doesn't matter if viewers aren't willing to suspend their belief for the irregular set-up and perhaps stay with the film past the fast-paced and clarity-challenged opening act. Yet, if we can do this in outright fantasies, I'm baffled why it seemed so foreign to viewers with this work as it at least tries to base itself in some form of reality involving genetic research, a traditional marriage in nontraditional circumstances, and the complexities of relationships, pregnancies, life and death. 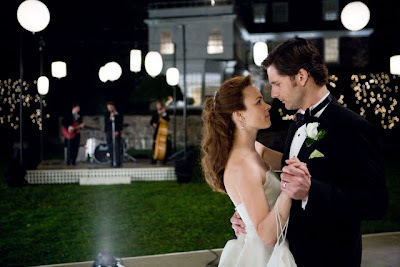 Despite its melancholic twinges that pervade when we realize that-- much like Benjamin Button or Somewhere in Time-- there's a bittersweet edge to the storyline, which is perhaps a bit too truncated here considering the fate of our leading man, it still never feels as easily manipulative as a Nicholas Sparks movie. And perhaps the reason it works here is because Time touches on a lot of issues that could be taken allegorically like "time travel" as a metaphor for disability a.k.a. the same sickness and health vow uttered when Clare finally does become the wife in the title. Instead of blindsiding us with the type of car crash that kills Henry's mother in the beginning or delivers a bizarre form of Sparks-like Christian atonement in axing our leads for no reason in the works from that author, the relationship between the lovers is the anchor for this particular film. And this decision by filmmaker Robert Schwentke and screenwriter Bruce Joel Rubin allows the intricacies of time-travel to float off in the distance so that we're more invested in the two rather than the technical specifics of the supernatural-- (read: not rooted in science or nature)-- aspect of make-believe. Thus, because there's nothing real about the vanishing, then everything about Henry and Clare's love seems real, which is what matters the most in any marriage whether it's on or off the screen and in whatever time period you happen to find yourself in at any given moment.